If you are worried about gaining tons of weight during the upcoming holiday season, here is my seasonal gift to you. But before you pop the celebratory champagne, here’s the not-so-jolly news. According to research, many of us don’t lose that pound of post-holiday weight gain, but rather we carry it over year after year. After a decade of holiday celebrations, it’s no wonder that those jeans need more effort to zip up. 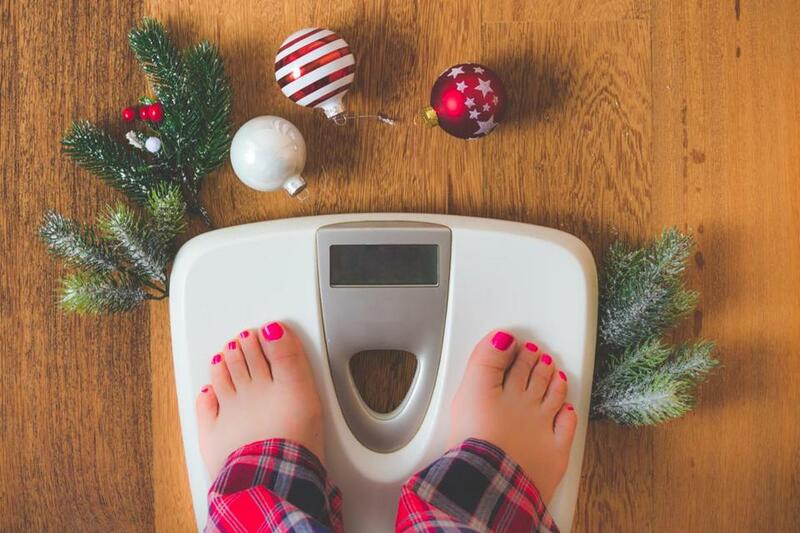 The culprit behind this holiday weight gain is a combination of a stressful, jam-packed, six weeks of too many obligations and parties with too much food and alcohol combined with too little physical activity. Now, here comes the somewhat jolly news. According to an article in the Journal of the Academy of Nutrition and Dietetics, mobile apps have been shown to help folks lose and manage their weight. In fact, in a recent commentary in the Journal of the American Medical Association, a group of physicians are now advocating that the US Food and Drug Administration improve its current health app certification program. They are smartly recommending that the FDA program include a grading system that informs us just how well a specific app will help us better manage our diet, stress, and physical activity levels before we download it. To defuse holiday stress, Keri Gans, certified yoga instructor and author of “The Small Change Diet” looks to Headspace, a meditation app that helps her keep calm and carry on. If you are new to the meditation world, this app can be a gateway into a daily routine or at least provide daily reminders to stay calm until New Year’s Day, and hopefully, beyond. Marisa Moore, a culinary and integrative dietitian, recommends that the first gift that you buy this holiday season is the app Happy Not Perfect, for yourself. This app encourages mindfulness during the day through guided breathing and shoulder exercises. The program not only walks you through activities to help reduce stress, it also prompts you to focus on points of gratitude and positive thoughts daily. It’s the gift that keeps on giving. If holiday stress is causing you to eat anything that is not moving, Samantha Cassetty, a weight loss expert, recommends downloading Insight Timer. This meditation app has over 5 million users looking to reduce stress and improve both the quality and duration of their sleep. Being well-rested can help reduce the cravings for sugary, carbohydrate-rich food that seem to magnify when you are tired. Since exercise is often the first thing to fall off track during the holidays, Chrissy Carroll is a fan of Strava. The app is part activity tracker and part social networking. You can follow other users and give kudos to your friends as they complete their physical activities. Sometimes you just need a supportive buddy during hectic times to keep you on track. Sworkit is the app that Angela Lemond, an Academy of Nutrition and Dietetics media spokesperson, swears by when traveling during the holidays. You can choose a variety of activities such as yoga, Pilates, or a boot camp workout. It’s like having a personal trainer on your smartphone that you can call up on the cheap in your hotel room. Cookbook author Toby Amidor uses the FitBit app to help her track not only her daily activity levels but, equally important, her sleep. The more rested you are, the more you tend to move. Both activity and sleep are key to managing your weight and health during the holidays. Jessica Crandall, another spokesperson for the Academy of Nutrition and Dietetics, recommends MyFitnessPal because it is a great app for tracking both your diet as well as your activity. The app helps keep you accountable to your goals and gives you insight as to where you can make doable modifications. According to Crandall, accountability and education are powerful tools to help you achieve your goals during the holiday season. According to Amy Gorin, a New York City dietitian, journaling can help bring on the calm before hitting the sack. She uses Evernote to jot down her thoughts at bedtime. The investments of a few minutes journaling each night enables her to slow down her mind so that she can fall asleep. She suggests creating a notebook within Evernote just for your sleepy-time journal entries. Do you have a favorite health and fitness app that you use? Please share it in the comments section below.